TAKING the dog for a walk isn't quite what it used to be: she's had her hackles up ever since springing us showing friends a video of a walk we had with a cat. But try explaining to a highly-sensitive miniature poodle who's got a half dozen other breeds mangled through her genes, together with an intellect she believes is superior to ours, that the cat you were walking with was in fact Panthera Leo – the African Lion – and that she should therefore look up to us in admiration of our bravery and daring, and all we get are scowls of disdain. To her we are simply wimps who not only went for a walk with a cat, but worse still had to have guides with us to do so, and great big sticks in case kitty decided to get frisky. 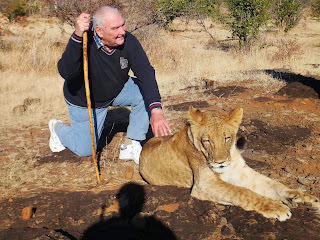 Panthera Leo, African Lion, call it what you will, but to our pooch it was a cat – OK a big cat, but still just a cat. So we've accepted it's little wonder she's got her hackles up as she wrestles with her new-found situation of living with those who are scared of cats. 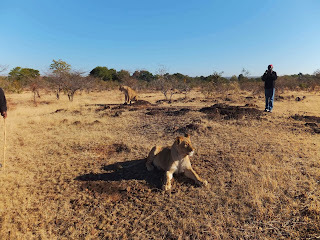 But while she sulks, at least human friends and family marvel at our perceived courage: it's not every day one goes for a walk in the African bush with an unleashed lion at their side, and we're going to dine out on it for as long as we can. 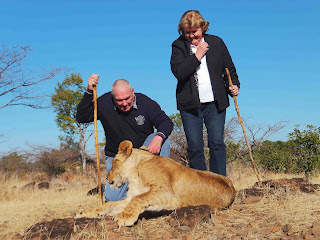 Lion Encounter where we engaged in this bravado is an extraordinary conservation program in Zimbabwe helping to re-build numbers of the African lion, whose population across the continent has plunged from 200,000 in 1980, to under 30,000 today – with Kenya, experts fear, having no lions left in the wild in five years. The reasons are many: hunting, human encroachment by way of cities and farms into the one-time domains of these kings of the jungle, feline AIDS and feline TB, and a testicular disease that's dramatically slashed male lion's breeding rates. And bizarrely that lions are actually bad mothers: they'll readily abandon sick and weaker cubs, leaving them to die or fall victim to other beasts. 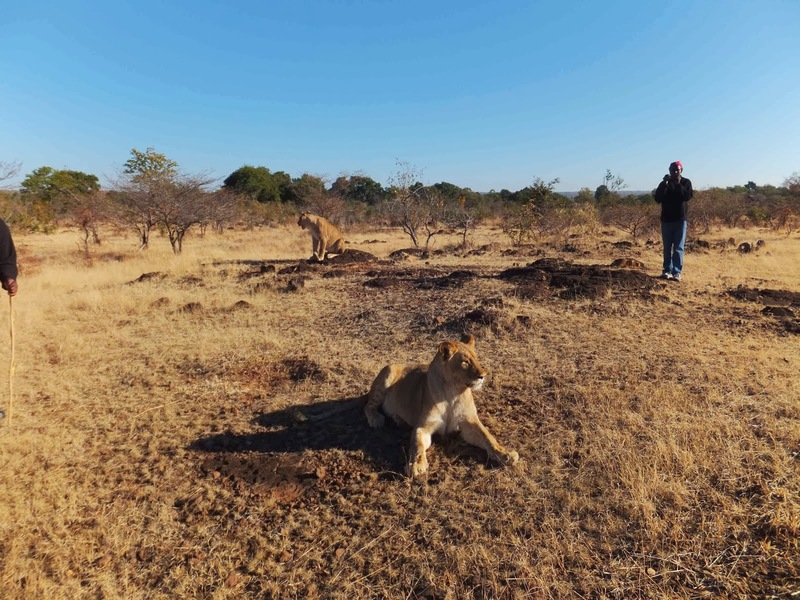 Lion Encounter is part of the larger African Lion Rehabilitation and Release into the Wild Program, that raises young cubs found sick or abandoned in the bush, or which are specially bred for the program at Zimbabwe's Antelope Park lion breeding centre. 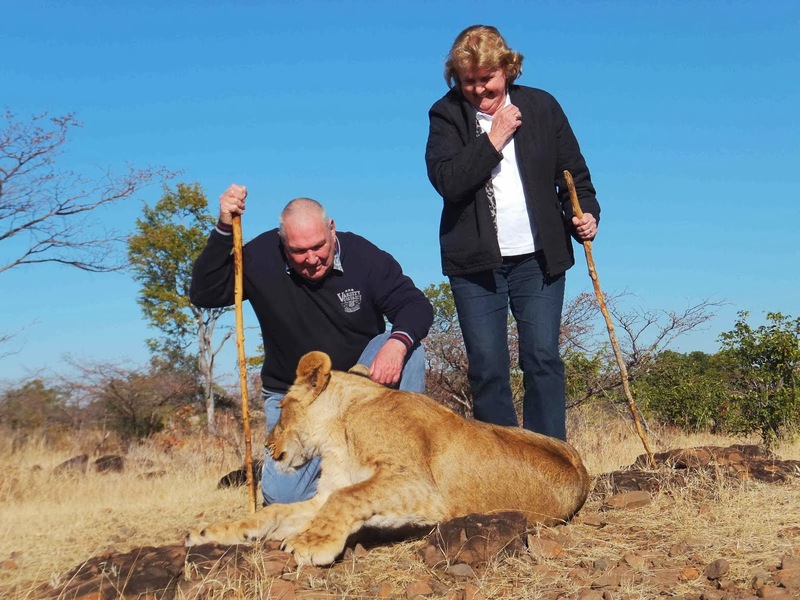 The cubs spend their first three to eighteen months at Lion Encounter, just outside Victoria Falls township, being taken out daily into the bush with staff and paying-visitors to become familiar with their natural environment, and to develop and hone stalking and hunting skills. And amazingly the cubs accept their human companions as being part of the pride, those behind the scheme pointing out the important role of visitors in both helping the young animals become used to their surrounds while daily refining their natural predator instincts, and in also contributing much-needed funds for the maintenance of the program. 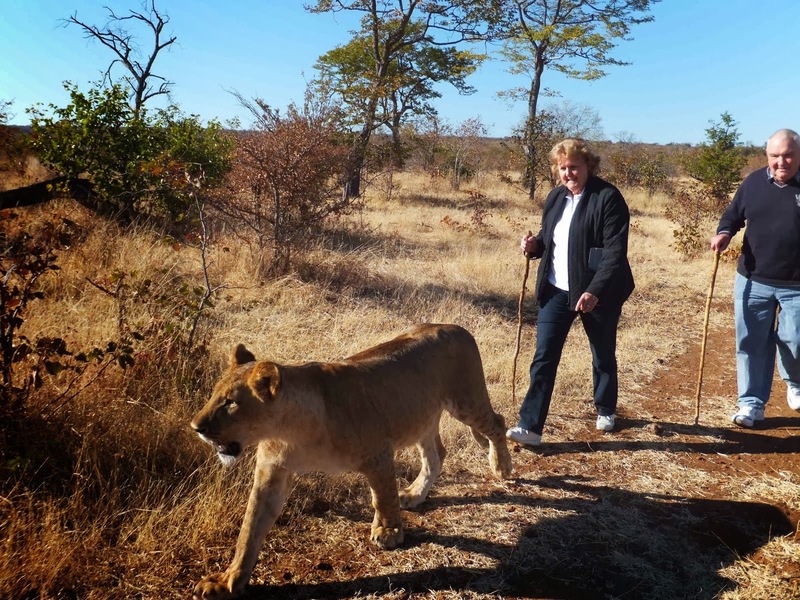 Last year alone over 10,000 visitors – fifteen per cent of them from Australia – took part in a "Walk with the Lions" at Lion Encounter. 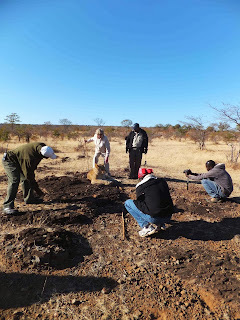 When they reach 18 months the young lions are moved to a 400ha enclosed "safe zone" with no human contact, and after a year there learning to live by their wits (and with occasional supplemental carcass droppings to help them along,) are moved as a pride to yet another much larger bush area where they will spend the rest of their lives in the wild. Their cubs in turn will come up in a totally natural environment, and when mature enough be trapped and relocated to other parts of Africa needing to re-stock their depleted wild lion populations. And new cubs will be recruited into the Lion Encounter "Walking with the Lions" program, where the whole cycle will begin all over again. veteran who's done it all before. 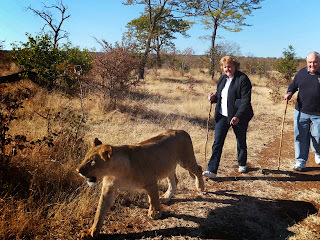 day "Walking with the Lions. THE writer with his wife Gwenda get up-close with Thuli – or was it Thembi? AND she leads them off on their never-to-be-forgotten "Walking with the Lions."